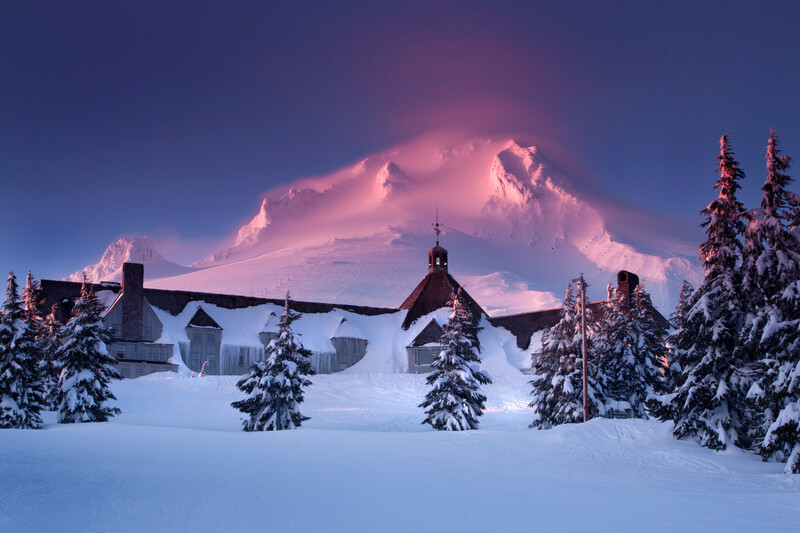 Offering the longest ski season in North America, Timberline Lodge is located near the base of Mt. Hood, 60 miles east of Portland International Airport. Most years, Timberline’s ski season begins around early to mid-November and continues through Labor Day, with a short closure (snow permitting). Mt. Hood’s elevation tops out at 11,245 feet, making it the tallest mountain in Oregon. Timberline Lodge boasts the Pacific Northwest’s longest vertical drop at 3,690 feet from the top of Palmer Express to the bottom of Still Creek Basin. Skiers and riders will find 1,415 skiable acres and 41 trails serviced by nine lifts. A passenger snowcat offers additional access for the advanced to experts. Timberline Lodge offers multiple terrain parks that are maintained throughout the year. During the summer months, the freestyle terrain moves up the mountain closer to Mt. Hood’s summit, providing jumps and jibs off the Magic Mile lift. Built in 1937, Timberline Lodge is a unique lodging option located at the base of the ski area. Accommodations range from hotel rooms to luxury condominiums. Dining room in lodge, lounge, pool, ski shop, rental shop, and gift shop. Snowboard and ski school including SKIwee program for kids. Group and private ski lessons available for all ability levels. Summer training camps for all ages available.